Following its success with the Church of the Nativity, PA will seek to have additional religious sites recognized by UNESCO. Following its success in getting the Church of the Nativity in Bethlehem recognized as a World Heritage Site, the Palestinian Authority said on Tuesday it will seek to have additional religious sites recognized by UNESCO. According to a report in The Associated Press, the PA’s Foreign Minister, Riad Malki, named the Cave of the Patriarchs in Hevron and Mount Gerizim near Shechem as two sites the entity plans to have recognized by UNESCO as endangered World Heritage sites. On Friday, UNESCO's World Heritage committee approved a PA bid to place the church in Bethlehem on its list of sites of World Heritage in Danger. The 21-member committee, meeting in St. Petersburg, Russia, voted 13-6 to include the church and pilgrimage route on its list of sites. There were two abstentions. The U.S. State Department charged UNESCO on Monday with “hotwiring” the PA’s demand, after the United Nations agency rejected its own advisors’ opinions and named the church as an official Palestinian Authority heritage site. State Department spokeswoman Victoria Nuland said, “This procedure in the World Heritage Committee has only been used four times in the past, in extreme cases when the site in question was under threat of being torn down. That was not the case here…. 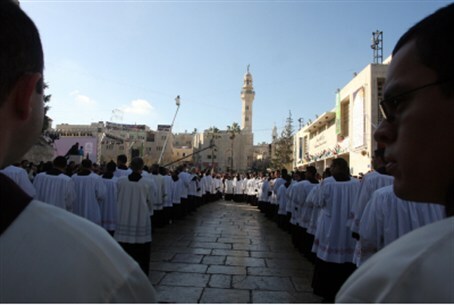 It – from our mind, it speaks to a political move rather than a well thought-out move with regard to the site…"
The Roman Catholic Church in the Holy Land on Monday hailed UNESCO’s decision as a “diplomatic victory” for the PA.
“Bethlehem is part of the Palestinian territories, so it was for the Palestinian Authority a right and indeed a duty,” the Latin Patriarchate of Jerusalem said. Israeli government spokesman Yigal Palmor dismissed the PA’s plan to add more sites, telling AP the move was “purely propaganda.” He hoped UNESCO would reject the move.